How do you explain Africa? | Learning to dance in the rain How do you explain Africa? How do you explain Africa? I just don't think you can explain this place. Pictures, words, and even video are just not adequate. You have to be here. You need to get the red dirt on your feet. You need to hear the sounds of the birds, bodas, cows, cars, music, drums, traffic, people. You have to see the city, villages, babies, people, mountains, trees. Uganda has a smell….but it isn’t like anything else. So how do you explain it with words? Words just don’t suffice…..so a quick update on our trip will just have to do! I am get out of car. The LONG process is almost finished. Deb has an appointment tomorrow afternoon at the embassy to get Z’s Visa, then once that is picked up they are all done and ready to head home! Deb knew that I only intended to stay 10 days max since I miss my babies, and this is my VERY busiest season of the year with work, BUT, I really wanted to be able to “complete my mission”, so to speak, so I am sticking around to fly home with them as planned! Lord willing, they will be home Wednesday afternoon and I will be home Wednesday evening! We have had the privilege of going to a number of awesome ministries while we have been here. First on the list of course was Ekisa. We traveled to Jinja to see them, but unfortunately when we arrived we learned that one of the children they have been caring for had passed away. It was a very sad day for them, so out of respect, we simply left the 3 suitcases full of supplies we had brought for them and we went on our way. I am so thankful to all of you who made the delivery of all of those supplies possible! I know they will be greatly blessed by all of it! Since we had some time and we were already in Jinja, we were able to stop by another ministry that Project Hopeful has helped out in the past, ate a little lunch at the Source Café and headed back to Kampala! A couple of days ago (it is all starting to run together now) we were able to visit an amazing place called Malaika Babies Home. It operates under a foundation out of Europe called Child's i Foundation. I have been to a lot of ministries to children and babies in Uganda and Kenya (side note-the solution to every problem is NOT to start a new non-profit…there are already plenty) and I can tell you that I have never seen anything like this place. I didn’t take any pictures (which was literally painful for me) so I will just have to try to describe it, but I promise my words won’t do it justice. They have a separate room with a designated nanny for each age group (0-6 months, 6-9 months etc) with a printed sheet posted on the door with the names, details and care instructions for each child. The clothes are all organized by size and in their own individual cubbies. The nurses have an immaculate room with detailed files neatly kept for each child. In each bathroom, they have a towel for each child on a hook and labeled with their names. The whole place is that way. Did I mention they did not know we were coming? This wasn’t “clean up for the mzungus” stuff…..this is their normal day to day life. They have 7 social workers on staff….SEVEN! Their mission is to keep abandoned children for no more than 2-3 months while they get them healthy and the social workers can find their families. Then they re-settle them back with their own biological relatives. If none of their family can be located, then they have a list of hundreds of Ugandan families who are on a waiting list to adopt them! So amazing. The last resort is to have them adopted by non-Ugandan families, and even then they try to place them with International families who are currently living in Uganda (and surprisingly there are a lot). Malaika is a perfect example of the fact that the solution to worlds problems is NOT to adopt all of their children into the U.S. or to Westernize everything. Seriously I was so impressed. Can you tell? : - ) Please check out their website! Yesterday we went to a village outside of Kampala called Ssenge. It is a very rural spot, and just 2 short years ago the hundreds of children there had no where to go to school, much less a place to be taught about Jesus, be fed etc. We were invited by one of Deb’s very good friends who runs the school to attend a big celebration there to end the semester. The people from the village were there, as well as the families of all of the students….we didn’t realize until we got there, and were ushered to the front row (of hundreds of guests) that we were going to be introduced over the loud speaker to everyone! This place has come a long way in just 2 short years due to the hard work of a handful of people. The children danced and sang….it was a beautiful thing to see! Today we went to church. Would it be totally un-reasonable to fly here once a month for church? Just wow. We went to Watoto church…..I love that this place is a relatively famous church/organization across the world, but their church is still simple. Yes it is in a big building, but they have done little to “western-ize” it which I think is awesome. The worship was fantastic…of course. I can’t attend Africa church without tears. A lot more has happened on this trip and we are doing all of it with 3 kids in tow, so that has been an adventure in and of itself! 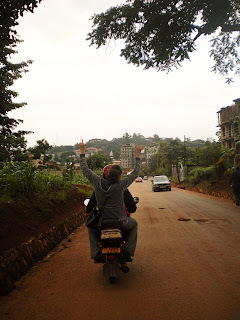 More pictures to come soon…..ish, but for now, I will leave you with two pics (which only took 2 hours to load) of my first ever boda boda (motorcycle) ride with Seth, and one of Deb on the boda in front of us, with the other 2 kids…..and of course the driver. I slept with a girl.....and I didn't catch HIV.